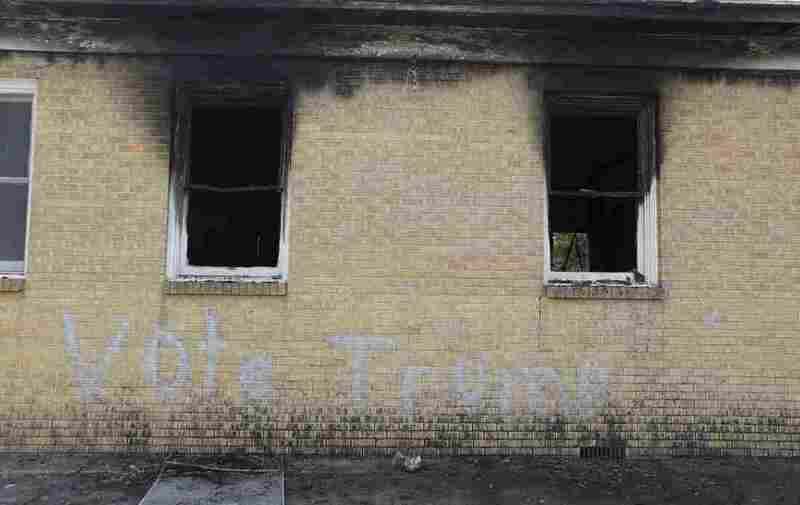 Mississippi Black Church Burned, Spray-Painted With 'Vote Trump' : The Two-Way The fire that largely gutted the century-old church in Greenville, Miss., has been ruled an arson. The mayor called the attack an attempt to scare voters days ahead of the presidential election. 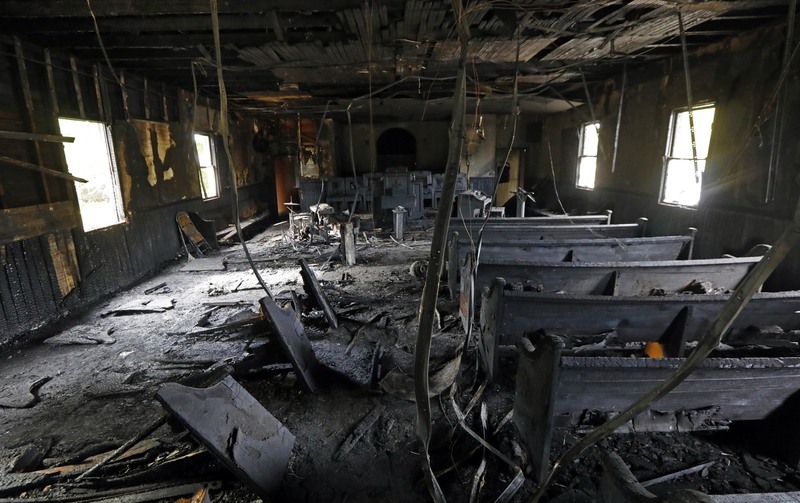 Burned pews, musical instruments, Bibles and hymnals are part of the debris inside Hopewell M.B. Church in Greenville, Miss., shown Wednesday. The mayor is calling it a hate crime as arson investigators collect evidence at the black church, which was heavily damaged by fire and tagged with "Vote Trump" in silver spray paint. The FBI has opened a civil rights investigation into the vandalizing and burning of a black church in Mississippi. "Vote Trump" had been spray-painted on a wall. Local authorities are still searching for the person or people responsible for the fire, which they have identified as an arson. "When firefighters arrived at Hopewell Missionary Baptist Church Tuesday night, they found it in flames, and the 'Vote Trump' slogan written in silver spray paint on the outside wall of the church," Mark Rigsby of Mississippi Public Broadcasting reports. "Greenville Mayor Errick Simmons calls this a hate crime — an attempt to frighten voters just days before the presidential election." "Vote Trump" graffiti was painted on the side of the church in Greenville, Miss., shown Wednesday. Fire Chief Ruben Brown tells The Associated Press that firefighters found flames and smoke pouring from the sanctuary of the church Tuesday night. Simmons said he saw the attack as "a strategy — an evil one." While the FBI has opened a civil rights investigation into the arson, The Associated Press reports that the agency says it's too early to say whether the fire should be considered a hate crime. A variety of state and local authorities are investigating the crime, Simmons told Mississippi Public Broadcasting. He says authorities are talking to a person of interest and have beefed up security around local churches, and he called on the public not to be intimidated away from voting. "Nov. 8, it's going to be a safe place here in Greenville," Simmons said. The church is more than 100 years old and is now largely gutted, Rigsby reports, but the pastor hopes to rebuild. Greenville is about 78 percent black, according to census data.
" 'First, anyone who burns a place of worship will answer to almighty God for this crime against people of faith. But they should also answer to man's law,' Bryant said in a statement. "Mississippi's top elections official, Secretary of State Delbert Hosemann, a Republican, said people shouldn't jump to the conclusion that the church was vandalized for political reasons. Initial reports suggest 'this is not of a political nature,' he told WDAM-TV."